About nineteen years ago, Diego Flores did not make the decision to move to the United States, because he was only an infant. Instead, his parents made the decision for him. They knew that if they migrated to this place, not only would they have a better life but the future course of their children would be completely change. Today, Diego is a freshman student at Southern Nazarene University. He is majoring in Worship Arts and has the desire to do missionary work after graduation. One of his biggest life goals was to attend college. Through DACA, a federal government program created by the Obama administration in 2012, Diego and about 800,000 people are able to attend school, work, and live in the United States without fear of deportation. 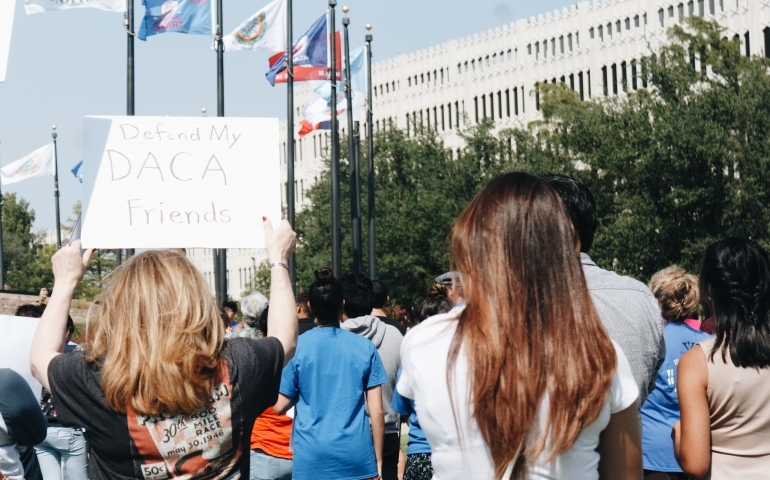 DACA is an acronym that stands for Deferred Action for Childhood Arrivals. Those who requested DACA had to meet certain requirements such as not pose as a threat to national security and have arrived before the age of sixteen. After providing documents and being approved by the government, Diego felt relieved. He was able to obtain a driver’s licence, work for painting company in Tulsa, and enroll in this school. Diego took a year off to earn money to meet the financial requirement to attend school. Because of his DACA status, Diego is not eligible to receive financial aid but said he is extremely grateful for the scholarships he received from his church. A this last week, Attorney General Jeff Sessions, part of the Trump administration, announced the end to DACA. If congress does not act by March 5, 2018, DACA recipients will lose their status. Those under DACA are referred to as “dreamers.” Diego and the rest of the dreamers could be greatly affected if congress chooses to do nothing about the termination of DACA. Diego does not remember his home country, but has grown to consider the United States as his home. Without DACA, Diego and the other 800,00 dreamers will go back to living a life of fear. Diego believes Christians should approach immigrants with love. He said, “As Christians, we should help and build up one another.” As someone who cares for the future of students like Diego, I urge you to contact your representatives through a phone call, email, or tweet and let them know this program benefits students at Southern Nazarene University. If you are not sure who your representative is, go to https://www.house.gov/representatives/find/. In addition to contacting your representative, you can get involved with El Camino OKC (The Way) which is a network of Christians and churches who promote immigration justice. They are involved in the community, and quickly organized a Vigil for Dreamers on September 10, 2017. You can follow them on their Facebook page called “El Camino OKC.” Through support, action, and our voice, let’s stand with the dreamers at Southern Nazarene University.